Video and music are essential entertainment to most of us on daily life. As to me, I am really a movie and music addict, it takes me at least three hours a day to enjoy movies and music, even more hours on weekend. And most time I play videos and music on my Samsung Galaxy S8, which is convenient and simple thanks to its portable design, light weight, long battery life and high resolution display screen. Meanwhile, I have a large media library on my computer local drive and usually transfer these video and music files to Galaxy S8, so that I can play them anytime and anywhere. Here I’d like to share my experiences about transfering video and music files from computer to Galaxy S8/S8 plus with you. To transfer videos and music to Samsung Galaxy S8 or S8 Plus for playback, I summarized sereval great methods to help you make it from different sources. You can simply choose a preferable one for yourself. Follow the next guide, it is very easy to transfer videos and music files from your Windows laptop or PC to Sansumg S8/ S8 plus for playback. Step 1: Connect your Samsung Galaxy S8/ S8 plus to your PC using the bundled Type C USB charging cable and then open a Windows Explorer window. Step 2: In the Explorer window, click "My Computer" (or "This PC’) and train your eyes on the Devices and Drives area. Your Galaxy S8 or S8 Plus should be listed here, with a phone icon to set it apart. Note: If you can’t see your Galaxy S8/ S8 plus there, make sure it’s definitely connected. If there’s still no sign, ensure that the Galaxy S8 is in transfer mode. To check the connection type, swipe down the notifications panel by dragging a finger from the very top of the phone’s display. If this is listed as ‘USB Charging’ or similar, change it to Transfer Media Files. Step 3: Once your phone appears in Windows Explorer, double-click that icon and look for a folder called Music and Video. Find the music and video files in your computer you want to move to your Galaxy S8/ S8 Plus and then simply drag and drop them into the phone’s Music and Video folder. They will be copied quickly, and then close the Explorer windows and disconnect the micro USB cable. You can also use the Samsung Smart Switch software to manage files on the Galaxy S8 or S8 plus. Smart Switch is a file syncing environment that is made for Samsung devices to easily transfer your music, videos and pictures. Just download and install the Smart Switch software from the Samsung website. Once the software is installed, it will automatically start when you connect the phone to your computer and is compatible with both Mac and Windows. Be sure to properly eject the device from your computer properly by right-clicking on the removable disk and selecting "Eject". You’re now ready to play videos and music on your Galaxy S8/S8 plus while on the go. Android devices such as the Samsung Galaxy S8 or S8 Plus don’t communicate well with Apple computers, which makes copying files between them quite annoying. Mac users can install the Android File Transfer on their Mac computer or Macbook laptop. This is a nifty bit of software created by Google to get around the communication problem. Android File Transfer (AFT) is completely free to download from Google’s website. 1. Once AFT is installed on your Mac computer, grab the Type-C USB charging cable that came with your S8 or S8 Plus. Next, plug Samsung’s phone into your Mac using that USB cable. Then a message reading "allow access to phone data?" will pop up on the phone’s display; just hit "allow"to accept. 2. A list of available folders on the S8 or S8 Plus will appear. This is your Galaxy phone’s internal storage, where all of your files are all stored. Find the Video( or Music) folder and double-click it to open it up. 3. From here it’s just a case of dragging your video files from your Mac device to your smartphone. Once the video copy is complete, just close AFT and disconnect your phone. To get around the format incompatible problem on Windows, you need to download the Pavtube Video Converter Ultimate. It is all-in-one software, which can convert all the media files including commercial Blu-ray, DVD, digital video and audio to Galaxy S8/ S8 plus compatible video and audio formats with high quality. I even can’t find any difference between the converted media files and the original one. To get better output video and audio quality on Galaxy S8/S8 Plus, you can use this converter to adjust output profile parameters including video codec, resolution, bit rate, frame rate, audio codec, bit rate, sample rate, channels, etc as you like. If you are running a Mac system, you can get a mac version for this converter—Pavtube iMedia Converter for Mac to transform media files on macOS 10.13, macOS Sierra, Mac OS X El Capitan, Mac OS X Yosemite, etc. This software is very easy to use and you can handle it quickly even without any instruction. Please download and install a suitable version on your computer. After download and install the best converter on your computer, follow this guide to get your work done. Here I take converting video formats on Windows system as an example. Start the program on your computer. 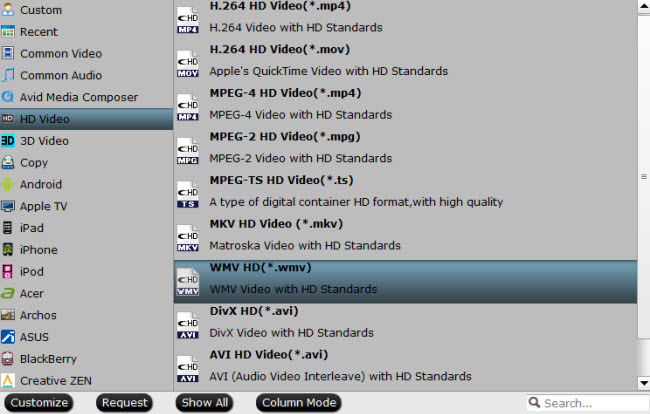 For loading digital video, click “File”> “Add Video/Audio" or “Add from folder” (batch load multiple files) option. For loading Blu-ray or DVD disc, Insert your Blu-ray or DVD disc into your computer’s optical drive , hit “File”>”Load from disc” option. Clicking the Format bar, from its drop-down list, you can find various video and audio formats are displayed here. Select one of Galaxy S8/S8 Plus playable video formats such as “WMV HD Video(*.wmv)” under “HD Video” main category. Tips: Click “Settings” on the main interface to open “Profile Settings” window, here you can adjust output profile parameters including video codec, resolution, bit rate, frame rate, audio codec, bit rate, sample rate, channels, etc as you like to get better output video and audio quality for Galaxy S8/S8 Plus. As we all know, both Galaxy S8 and S8 Plus have an aspect ratio of 18.5:9. If the output video aspect ratio doesn’t match with the phone’s display screen aspect ratio, there will be black bars around the video frame. 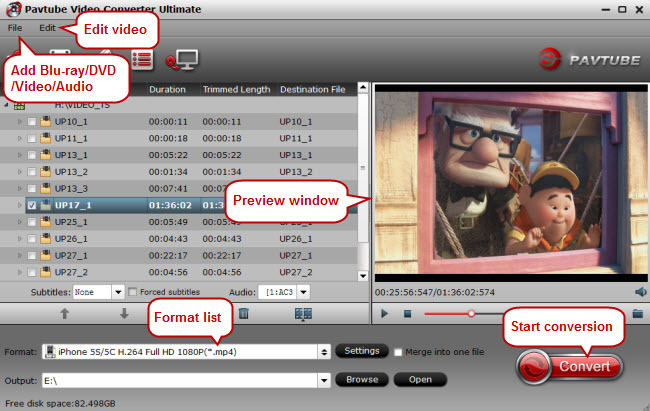 To achieve a better visual experience, you can click the "Edit" icon to open the "Video Editor" window. Go the “Crop” tab in the “Video Editor” Window, there are several aspect ratios for you to choose from. Just select Galaxy S8 or S8 Plus accepted aspect ratio 18.5:9 approximately 2:1. Once you select a "Display aspect ratio", the "green crop frame" will keep this ratio to crop video and you are able to preview the final effect in real time. Once all settings completed, hit the "Convert" button to start Blu-ray/DVD/Video to Galaxy S8/S8 Plus supported video and audio file formats ripping or conversion process. When the conversion is finished, click "Open Output Folder" icon on the main interface to open the folder with Galaxy S8/S8 Plus playable video and audio formats. After that, follow the steps in part one or part two to transfer video and audio files to your Galaxy S8/S8 Plus. Then feel free to play your favorite videos and music on your portable Samsung Galaxy S8/S8 plus. Hope this page will help you! Best wishes!